Michael Schumacher won his ninth victory in 10 races and that made the chaps down at Renault rather blue. 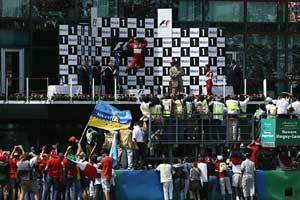 They thought that Fernando Alonso was going to win the 2004 French Grand Prix. The company had given thousands of grandstand seats to its employees, customers and dealers and they were all wearing the rights hats and waving their flags as the field streamed off towards the first corner. Watching on TV one got the impression that one of the seats filled by a Renault man had the word "Director" stencilled on the back. The TV cameras seemed to be fatally drawn to the blue cars although now and then they followed Michael Schumacher's Ferrari after he had got ahead of Alonso using a smart slash-and-burn four-stop strategy. The Renault was quick and because overtaking is so tough at Magny-Cours might have stayed ahead if Ferrari had stuck to a conventional strategy but such is the self-confidence in this team that when Race Strategist Luca Baldesserri came up with the idea of doing four-stops, Michael was happy to give it a try. "We had nothing to lose," said Ross Brawn. "There was no risk because we were stuck in second and it would have been difficult to overtake. We needed to run in free air and to be able to use the car." That was what Schumacher did and the Renault boys could do nothing to stop the apparently inevitable from happening. Schumacher moved ahead and there he stayed. Alonso dropped away. It is nice to see a team do a great job but one has to say that the French Grand Prix of 2004 is not a race which will be stored on many videotapes in houses around the world. Sadly not. It was an impressive performance by Schumacher but it was not a great spectacle and people keep telling us that TV viewers want to see overtaking, crashes and spins. The French GP could barely manage a retirement. Twenty cars started the race and 18 of them crossed the line 90 minutes later. If there was ever evidence of why Formula 1 needs to ban testing here it was. If it hadn't been for Rubens Barrichello taking advantage of a dozing Jarno Trulli to grab third place at the penultimate corner of the race, there would have been little to say. Michael and Ferrari ran rings around the opposition. "I think that Michael was just stronger today," said a resigned Fernando Alonso at the end of the day. Trulli should have finished third but it was by no means certain. A blazing start took him from fifth on the grid to third and then he held on, and on, and on despite the best efforts of first Jenson Button (who sat behind him for 48 laps) and then Rubens Barrichello. Button felt that he might have popped up to third at the final pits stops but the anti-stall device kicked in and a couple of seconds were lost. Without that he would have been third. Takuma Sato was running the midfield early on but then the Honda went boom and that was the end of that. "Even I don't believe that bad luck stretches this far" said team boss David Richards, promising a rigorous investigation to find out what had happened. And so it was left to Trulli and Barrichello and on the final lap Trulli seemed to fall asleep and braked a bit too much at Chateau d'Eau. This gave Rubens a run at him on the run down to the penultimate corner, where he went down the inside and grabbed the position. "It was risky but I thought it was worth the risk." Trulli said that he was gutted but if the truth be told he had only himself to blame. It is not going to help him with his contractual negotiations. The McLarens came home sixth and seventh, which was exactly the same result as we saw in Indianapolis. But this did not mean there was not any progress. In America	several cars retired and so the old cars looked better than they were. At Magny-Cours the MP4-19Bs were better, but these are still not cars which will win races. The fuel loads run in qualifying were not very heavy and when the cars were loaded up with fuel during the third stint the lap times dropped off markedly and were far less impressive than the list of fastest laps would seem to suggest. On that list Kimi Raikkonen was beaten only by Michael Schumacher and Fernando Alonso but sometimes numbers can obscure the realities. It was nonetheless a good effort from the team, even if David Coulthard had gone from third on the grid to sixth at the finish. "If we had not messed up in qualifying yesterday we would have done much better," said Kimi Raikkonen. "The speed of the 19B is good." We will see just how good as the season develops. The last point went to Juan Pablo Montoya and he ought to have done better than that. In pre-qualifying on Saturday with fuel out of the car Montoya was amazingly quick but that was it. He qualified sixth and then dropped the ball just after the first pit stops. That dropped him down to ninth when he ought to have been fifth and at a place like Magny-Cours you don't come back from that. Montoya blamed it on a kerb. He also said that he had had a pain in his neck since his crash on Friday morning and was bothered by that late in the race. Marc Gene lost three places at the start including one to Mark Webber and that position remained the same all the way the finish. The Jaguar driver set the fourth fastest lap of the race but did not finish in the points which suggests that perhaps it would be wise for Magny-Cours to try to figure out how to create a place where overtaking is possible. The work done a couple of years ago was supposed to do that. Christian Klien finished 11th which was a pretty good effort. "This has been one of my best racing weekends so far," he said. The Saubers came home 12th and 13th. The team has planned to run two-stop strategies but Giancarlo Fisichella changed his mind and switched to three stops. Massa stayed on two. They finished 13 seconds apart proving that it really did not make much of a difference. The two Toyotas were 14th and 15th, which was not great considering that the team started 11th and 14th. Panis was left behind at the start when his clutch stuck and the anti-stall kicked in. He then had two bad pit stops which cost him another 10 seconds so 15th was not a bad result. The Jordans were next up with Giorgio Pantano a fair way down because of a drive-through penalty for speeding in pitlane. Gianmaria Bruni almost got his Minardi to finish but pitted on the last lap when the gearbox began to leak oil. It cost him nothing however as no-one else was left, Zsolt Baumgartner having fallen off earlier in the race.